The Peninsula Toy Run began in 1997 and is held on the first Saturday in December. It grows in popularity each year. Its founder John Smollen who organised the Toy Run from its inception passed away on 30 November 2013, just one week before his 14th Toy Run. 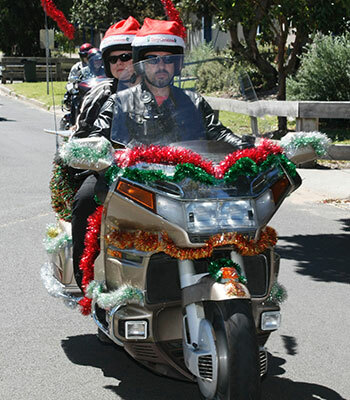 In 2016 a record 600 hundred bikers and their passengers travelled from Frankston Pier to Rosebud Secondary College bringing with them a huge amount of toys, gifts and food. Morning tea followed.” The 2017 Toy Run was marred by heavy rain throughout Victoria but still at least 150 bikers participated in the “Run”. Anyone interested in being part of the Toy Run will find information on the “Run” website or on Facebook. 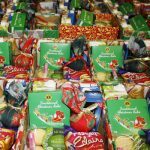 The bikers’ donations are equally divided between Food for All, the Rosebud Salvation Army, the Society of St. Vincent de Paul, Mornington and the Westernport Community Support in Hastings. The great generosity of the participants in the Peninsula Toy Run plays a vital part in the Christmas distributions of all four Organisations.